With the introduction of Google Glass, an effort to create and market computerized eyewear, Google has captured the imagination of technologists, consumers and even sketch comedy show “Saturday Night Live,” while also raising a number of social and privacy issues. Experts at Wharton say that the Google Glass experiment will be important to watch from a business, marketing and cultural perspective, and they add that no one — including Google — has any clue how the search giant’s efforts will play out. Google Glass is eyewear that incorporates a miniature computer with a display attached to its frame; it can shoot pictures, take video, run apps and deliver information such as travel directions. The interface is controlled by voice recognition — a user can say “take a picture” to snap a photo — as well as head nods and swipes of a control bar on the side of the glasses. Google began shipping its “Explorer Edition” of Google Glass in April for $1,500 — a version that isn’t meant for mass consumption, but rather for software developers looking to explore uses for the eyewear. In many respects, Google Glass is a grand experiment, and the search giant has enlisted the large ecosystem of programmers for the company’s Android operating system to refine the eyewear before it is released to the public. Speaking at the Google I/O developer conference in San Francisco on May 16, Timothy Jordan, senior developer advocate at Google for Project Glass, said to software developers that the company wanted them to “tell us what your dreams are for Glass.” Jordan also noted that Google was creating more tools they can use to introduce services for the device. Fashion for the Socially Inept? According to experts at Wharton, Google is taking a reasonably slow approach to Google Glass by keeping the audience limited, building buzz and developing its eyewear ecosystem. On May 16, the company announced that a series of popular applications such as Facebook, Twitter and Evernote would be available on the device. Indeed, social acceptance of such a device will be critical for adoption — and so far, the jury is out. A recent “Saturday Night Live” skit mocked the Google Glass voice and gesture commands and questioned whether consumers could really carry on a conversation well — or at all — while wearing the device. Essentially, the comedy sketch portrayed a Google Glass wearer as socially inept. Given the uncertainty, Fader argues that Google needs to follow a “skim” marketing strategy. A skim strategy focuses on putting a product in the hands of lead users or “influencers” — in the case of Google Glass, that would be tech bloggers and software developers. From there, the product can spread organically. Cell phones in the 1980s illustrate a skim strategy, says Fader. Initially, mobile phones were marketed to physicians and real estate professionals who needed a way to remain in contact with others, but the devices eventually went mainstream. An alternate “penetration” marketing strategy would revolve around a big-splash approach. A classic example is the 2001 launch of the Segway transportation device on “Good Morning America.” The Segway was never adopted widely, however, and Fader notes that it may have been more successfully marketed to niche segments such as airport workers or security guards. There is some element of a penetration strategy for Google Glass, he adds, given that the Google’s device has received fairly widespread attention — or at least enough to warrant the “Saturday Night Live” parody. “Google Glass is interesting because it has aspects of both penetration and skim [approaches]. Google has to think that [marketing] decision through, because Google Glass’s early PR may be creating more buzz and frenzy than Google wants to create. Google may want to restrict distribution or raise prices to slow things down so Glass can trickle into society,” Fader says. According to Wharton legal studies and business ethics professor Andrea Matwyshyn, consumers will need time to learn how to incorporate Google Glass into daily life. “Google has to be careful not to overwhelm people with novelty,” she says. Bite Interactive, a mobile application company, conducted a survey in which only one in 10 U.S. smartphone owners said they would wear Google Glass regularly. The survey, which polled 1,000 adults, also found that 38% of respondents wouldn’t wear Google Glass even if it were priced within their budget. Another 45% indicated concern that Google Glass would be too socially awkward or irritating to wear. “There are privacy implications, and [our] interactions will change because of the way these digital-physical hybrid devices change human relations,” adds Matwyshyn. “We’re entering a wearable cyborg model. It sounds sci-fi, but it’s becoming reality. Glass will force us to start thinking about [new] approaches to policy and law.” Recently, eight members of the Congressional Bi-Partisan Privacy Caucus sent a letter to Google CEO Page asking about the privacy issues raised by Google Glass and the company’s policies and expectations regarding those issues. The Fourth Amendment to the U.S. Constitution protects against warrantless government searches whenever there’s a “reasonable expectation of privacy,” notes Werbach. Google Glass, he adds, could create a world where it’s not reasonable to assume that an interaction with another person will be private. Speaking at Google I/O, Page said the technology industry needs to focus on “building great things that don’t exist.” Page also added that computers need to “get out of the way” and enhance lives while remaining in the background. Whitehouse notes that Google Glass is “another step toward interacting with technology in a way that’s transparent and so automatic you don’t have to think about it.” If Google leads that charge, the search giant will be able to manage the information generated by devices and customers and use it to create revenue and improve products, he adds. Google’s primary role could be to offer services to these new computing devices — whether glasses, watches or other future devices, says Werbach, who notes that many technology giants such as Microsoft, Apple and Amazon also offer hardware, services and software. Google executives haven’t talked about how Glass will make money. Under Google Glass’s terms of service, developers are not allowed to take payments or monetize their apps through ads. Experts at Wharton predict that Google will ultimately monetize Google Glass somehow, most likely through targeted advertising. According to Yildirim, technology is becoming increasingly mainstream, so Google Glass could become fashionable yet. 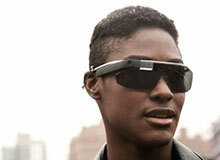 As a result, Google Glass may become more than a techie accessory worn at developer conferences such as Google I/O. “The gap between market cool and tech cool is not large; tech cool [could become] market cool in no time,” she says.